Discerning music lovers can step up to a more satisfying listening experience with the newest range of premium in-ear headphones from Sony. 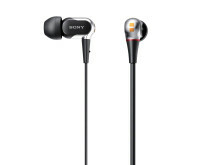 They’re the first headphones from Sony to feature innovative new Balanced Armature (BA) technology that radically reduces driver size compared with conventional dynamic headphones. 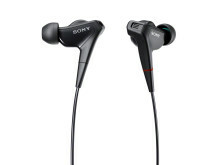 This advanced new design delivers superb sound quality, high sensitivity and enhanced noise isolation. For the first time, it also allows multiple drivers to be combined in a single headphone to achieve unprecedented levels of sonic transparency, detail and musicality. 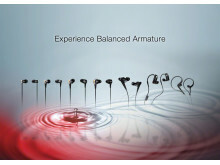 The XBA range spans 11 high-performance models to cover a wide range of lifestyles and listening preferences. 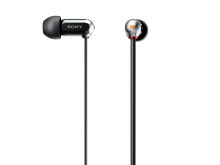 At the heart of the new headphone series is an innovative Balanced Armature (BA) drive unit developed specially by Sony. Less than a quarter the size of a conventional 13.5mm dynamic drive unit, the Balanced Armature driver offers comparable sensitivity in a sealed, ultra-light unit that delivers ultra-detailed sound. Unlike conventional full-range dynamic drivers, individual BA units can be ‘tuned’ for optimal reproduction of bass, midrange or high frequencies. What’s more, the tiny size of each BA driver means that several units can be combined in a single headphone – just like hi-fi speakers with separate woofer, tweeter and midrange units. As well as contributing to a supremely comfortable in-ear fit, the tiny BA driver’s Noise Blocking Structure improves sound insulation – both into and out of the headphone. 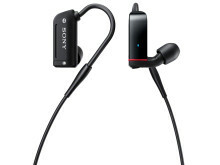 Compared with dynamic driver designs, extraneous sounds entering the ear are reduced for a more immersive listening experience with less distraction from outside noise. Sound leakage out of the headphone is also reduced, ensuring that your listening stays more private while other people are around. Enclosing the drive units, XBA-1/2/3/4 models feature a double-layered housing. This vibration-damping design cuts unwanted resonance for exceptionally smooth upper/midrange reproduction. 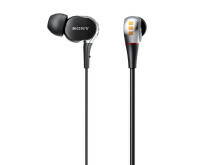 Whether you’re a fan of jazz, vocals, classical or urban beats, you’ll find the in-ear headphone from Sony that’s perfectly in tune with your listening tastes. With its single full-range Balanced Armature driver, the XBA-1 delivers superb reproduction of any music source with an emphasis on clear, crystalline vocals. The XBA-2 adds an additional low-frequency (woofer) drive unit, making it the perfect choice for dance fans who demand pumping bass beats. The XBA-3 gains a third high-frequency driver (tweeter) that gives an ultra-detailed polish to high frequencies. For the most dedicated audiophile, the XBA-4 features no less than four drive units: full-range, woofer and tweeter plus an additional super-woofer for extended sub-bass. Ideal for mobile music lovers, XBA-1iP, XBA-2iP, XBA-3iP, XBA-4iP models add the convenience of an in-line remote to control music player functions. 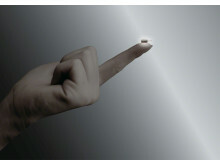 There’s also an integrated mic that lets iPhone users enjoy hands–free calls. Enjoy your favourite sounds in blissful silence with the XBA-NC85D: the world’s smallest, lightest in-ear digital noise cancelling (DNC) headphones. The micro-sized BA driver also allows space within the headphone body for an integrated power-saving DNC processor plus microphone and rechargeable battery. 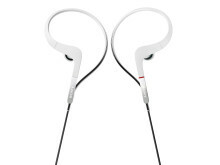 This space-saving design makes the XBA-NC85D the world’s first ‘box-free’ digital noise cancelling in-ear headphone. Artificial Intelligence (AI) noise cancelling technology automatically analyses background noise, reducing ambient noise by 97.5%. Battery life is an extra-long 20 hours. The headphones can be conveniently recharged via USB from any PC: just plug the audio jack into the supplied USB-AC charging adaptor. Enjoy the convenience of listening to wire-free music streaming from your smartphone or other Bluetooth®-enabled devices. Offering a stylish, comfortable fit, the XBA-BT75 accommodates tiny BA drivers as well as Bluetooth® receiver and antenna within the headphone itself. There’s also space within the headphone housing for a rechargeable battery that provides power for 3.5 hours uninterrupted wireless listening. Like the XBA-NC85D, this ‘no battery box’ solution eliminates the need for a separate control box to house electronics and power source. The supplied carry case doubles as a handy ultra-portable charging station. With its own integral battery, the case gives power for up to 2.5 recharge cycles of the headphone: plenty to power up your ‘phones for the commute home after a day at work. 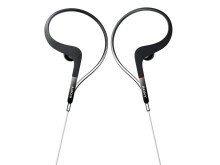 Designed to match contours of the ear for a secure, comfortable fit, the XBA-S65 brings a more detailed, hi-fidelity soundtrack to your workout or run. Washable and waterproof, it features a high sound transmission waterproof film coating that protects the driver from splashes and brief immersion. It’s ideal for rain-soaked training sessions or even that post-workout shower. 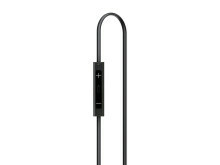 The adjustable ear loop mechanism provides for secure, fitting comfort – all without sacrificing audio performance and maintaining superb sound quality. 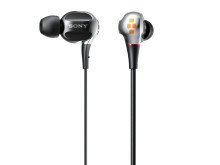 The new range of premium in-ear headphones with Balanced Armature technology from Sony is available from beginning of April 2012.